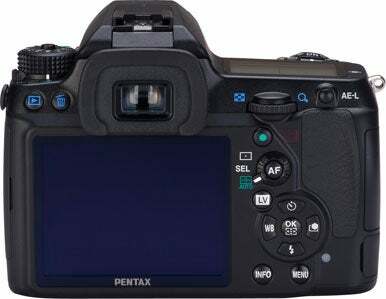 Pentax Monday announced its new K-5 digital SLR camera to replace the K-7. The $1600 K-5 is aimed at a more advanced photographer than the company's $800 K-r model, which was released earlier this week. The 16.3 megapixel K-5 has an ISO range of 100 to 12800 (expandable to 51200) and it can take up to 7 frames per second in continuous shooting mode. It features a greatly improved 77 segment, 11 point autofocus system with nine cross-type sensors and a spotbeam AF projector. The K-5 has a maximum shutter speed of 1/8000. The magnesium alloy and stainless steel body of the K-5 looks similar to the K-7 and is dustproof and weather- and cold-resistant. Photographers can compose their photos using Live View on the 3-inch, 921,000 dot LCD screen, or use the pentaprism optical viewfinder with 100% coverage and .92x magnification. There's an HDMI port and one memory card slot, which is compatible with SDXC cards. The K-5 has a new HDR mode and noise reduction (NR) functions. Creative shooters can edit images in-camera using nine custom image modes including multiple sharpness modes. There are 18 creative filters that can be combined in different ways and added to images in-camera. There's also a cross-process mode which imitates the saturated effects of cross-processed film. Video enthusiasts can capture 1080p HD video at 25 frames per second (fps), though it doesn't have the continuous auto-focus feature found in many of the other DSLRs released this Fall. The K-5 will be available in October for $1600 for body only, or packaged with an 18-55mm lens for $1750. 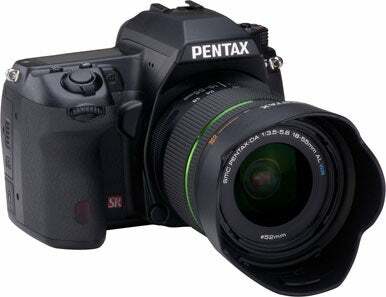 Pentax is also releasing a 18-135mm, f/3.5-5.6 Penax-DA lens for $530.